Wedding sparklers- Light up the party! 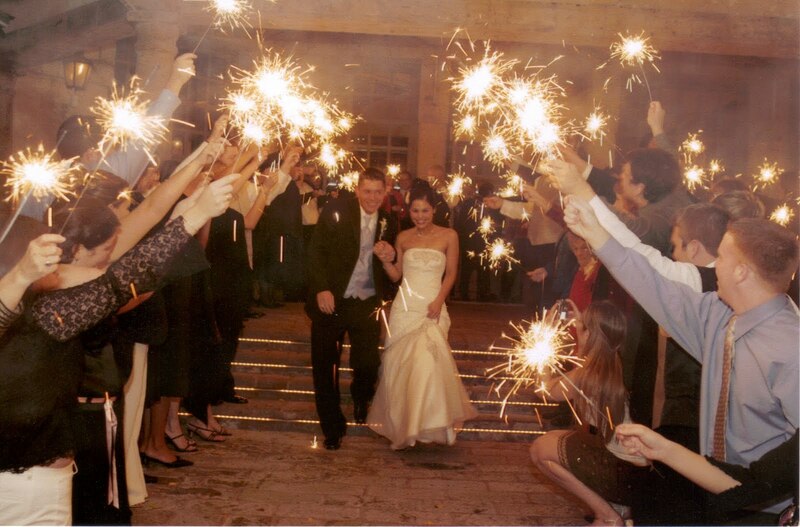 Wedding sparklers are a fun way to light up your night. Make a tunnel for the bride and groom’s grand exit, take fun photos, spell out meaningful messages, or just bring some fun entertainment to your event. No matter the purpose, sparklers are always a hit. They’re romantic and beautiful, and take us back to playful summers when we were children. This season we’ve seen a lot of sparklers for the first dance, which made for some really incredible photos! At most of these weddings, the guests circled the dance floor with them while the bride and groom had their first dance. The effect can be very dramatic, especially after dark. The bride and groom’s exit! Be careful when handling sparklers because they have a silver film that can leave a residue on your hands, and can easily be transferred onto your clothes. It’s also important when using any kind of fireworks to be aware of your surroundings and steer clear of anything that can easily catch fire. If you’re outside, be aware of heavy wind which can carry the sparks around. You won’t want little burn holes in your table linens or clothes. Dress up your sparklers display in a way that fits well with your event. Add custom tags with messages to each sparkler, or to a table sign. Mix in some candles and flowers to tie the display together with the rest of the event. And don’t forget to plan ahead with a way to light them. Lighters and matches are great, but can be temperamental. Using candles to light sparklers is an easy way to make double use of your wedding decor. Finally, be sure to leave enough time for lighting them all. Getting 50 or more sparklers lit all at once can certainly be done, but definitely requires some planning! « Bride hair accessories- Cabo brides love these!